Before joining Columbia University as Director of Maternal Fetal Medicine (MFM), Dr. Wapner was a Professor of Obstetrics and Gynecology at Drexel University College of Medicine. Prior to Drexel, he taught at Thomas Jefferson University for 22 years where he also served as the Director of Maternal Fetal Medicine. Dr. Wapner is a nationally known clinician specializing in first trimester screening and invasive procedures, such as Chorionic Villi Sampling (CVS), Percutaneous umbilical cord blood sampling (PUBS) and amniocentesis. He was instrumental in developing CVS and multi-fetal reduction procedures. He has also authored or co-authored over 120 publications. 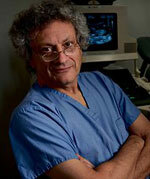 He has been an active investigator in the area of Maternal-Fetal Medicine throughout his career and has been, or is, either a Principal Investigator (PI)or Co-Investigator for a number of multi-center studies including much of the original work on chorionic villus sampling and multi-fetal pregnancy reductions. Dr. Wapner has played a significant role in the development of multidisciplinary research studies and clinical research centers for MFM throughout his career. He continues to practice clinical MFM, reserving approximately 25% of his time for research activities. He served as the PI for the Philadelphia Center in the Maternal Fetal Medicine Units Network from more than 8 years and has continued that work at Columbia. He also served as Co- PI of the National Institutes of Child Health and Development (NICHD)-sponsored NIFTY trial investigating the retrieval of fetal cells from maternal circulation. He served as Co-PI of the EATA trial in which 13 centers in the US and Europe performed a randomized comparison of amniocentesis and CVS in weeks 13 and 14 of gestation. This study also evaluated the efficacy of first trimester screening for fetal aneuploidy in a multi-centered fashion, for which Dr. Wapner served as PI.